Are you seeking the joys of an independent customised villa designed to your desires, located in an eco-sensitive and serene environment. Welcome to Mansions Misty Meadows Villas at Pidaram, near Thirumala, Trivandrum. 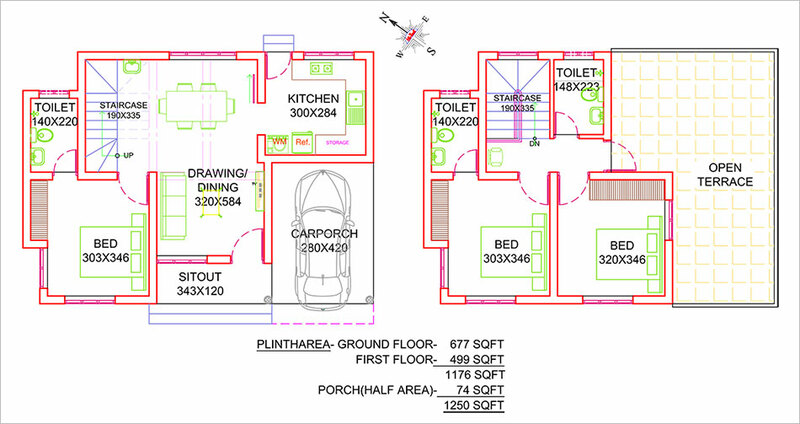 Welcome to the concept of Flexi Villa- Plots, starting from an area of 1250 sq.ft. You can move into your Mansions Misty Meadows Villa within 12 months of signing the agreement. Come home to a down-to- earth builder in Trivandrum: professional, technocrat-driven, trusted, with a 30-year legacy. Mansions Misty Meadows at Pidaram, Thirumala is an ongoing villa project in Trivandrum, but it is unlike other villa projects in Trivandrum. There are no readymade villas for sale, which can be occupied instantly. It has been normally seen that in villa properties in Trivandrum, budget villas or luxury villas are offered where there may not be flexibility for the owner to customise. There are also cases where contractors/developers in Trivandrum sell villa plots which may not be fully developed as a gated community. However there is a growing clientele of homebuyers who aspire for villas in Trivandrum, but at the same time wish it to be customised to cater to their individual needs and internal aesthetics. 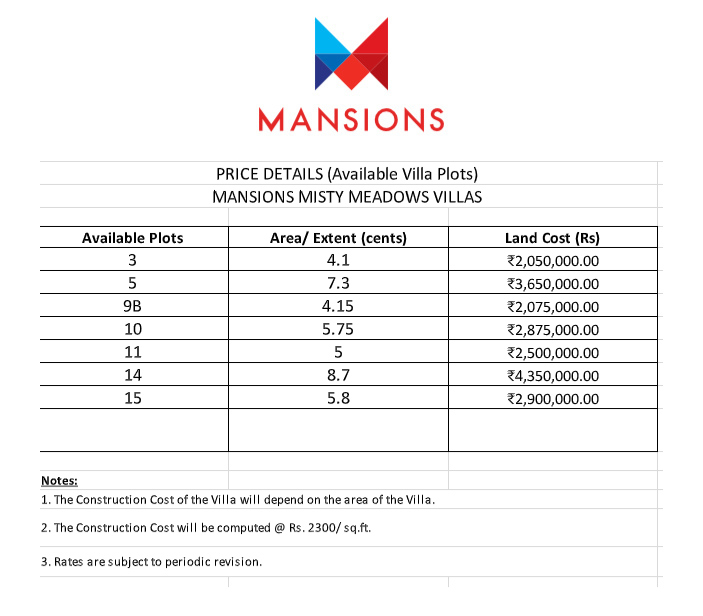 The Mansions Misty Meadows project offers villas in Thirumala, Trivandrum which have flexi villa-plots which can be designed and built as independent customised homes; along with an overall common external design architecture, with the additional comfort of a secure gated community. Moreover, there is a provision to club flexible villa-plots if a larger home is required. In Mansions Misty Meadows, you virtually live in the midst of nature. At the same time all the basic facilities that a family expects are within reasonable distance. There are schools (7), colleges (5), hospitals (4) and banks (4)—all within 6 KMs of this project. Some of the other landmarks which are within 6 KMs of Mansions Misty Meadows are: SP Convention Centre, SP Cinemas, Pangode Army Camp , SBI Local Head Office, HLL Corporate Head Office, Sree Chitra Tirunal Institute for Medical Sciences & Technology, Rajiv Gandhi Centre for Biotechnology and Alakapuri Auditorium . The word “Thiru” means holy and the word “mala” denotes a hill Hence Thirumala can be understood as “Holy Hill”. A popular Trivandrum suburb, Thirumala is logistically convenient due to its proximity to the Thampanoor Central Bus Station, Trivandrum Central Railway Station, Vazuthacaud and other convenient places for a family. Mansions also offers premium luxury apartments in Kowdiar and low rise apartments in Peroorkada, Trivandrum. St. Xavier’s School (2 km), Viswa Prakash Central School (2.5 km), Carmel Higher Secondary School (3 km), Shantiniketan School (4.5 km), Saraswathi Vidyalaya (3.5 km), Kendriya Vidyalaya- Pangode (4.5 km), Bharatiya Vidya Bhavan (6 km). LBS Institute of Technology for Women-Poojapura (6 km),Institute of Co-operative Management- Poojapura (6 km). Local Shopping Markets – Peyad Jn (1.5 km), Thirumala Jn (3.5 km), Malayinkeezhu Jn (3.5 km). Life Cares Hospital (3.5 km), Brain & Bone Clinic (4 km), SK Hospital (6 km), Govt. Panchakarma Hospital (6 km). SBI (1.5 km), Federal Bank (1.5 km), Canara Bank (2 km), ICICI Bank (3.5km). SP Convention Centre (1.5 km), SP Cinemas (1.5 km), Pangode Army Camp (4.5 km), SBI Local Head Office (5 km), HLL Corporate Head Office (5 km), Sree Chitra Tirunal Institute of Medical Sciences & Technology (5.5 km), Rajiv Gandhi Centre for Biotechnology (6 km), Alakapuri Auditorium (6 km). Walls In Brick Work With Rcc Roof Slab. P.V.C/ Fiber Moulded Door Frames And Shutters For Toilet Doors. Acrylic Emulsion Paint For Walls & Ceiling Over A Coat Of Puttv. Enamel Paint For Doors. Panampilly Nagar South, Kochi – 682036. © Copyright 2019, Mansions. All rights reserved. Mansions, Koyithara Road, Panampilly Nagar South, Kochi – 682036.